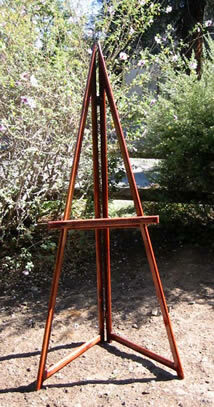 Need an easy-to-build easel for your art project or for a display? You can go to the art store and buy a big, heavy easel for several hundred dollars. Or you could pick up the little cheap things that fall over as soon as you put your canvas on it. Why not build your own? They are very simple to make and don't require fancy finishes…because you're going to slobber paint all over it anyway! Of course, if you plan to use it for display purposes, these attractive easels can be stained and finished, or built with a quality hardwood instead of pine. I was designated the "Official Easel Builder" for a friend's art studio. Each easel I built was better than the last. I came up with this very sturdy design that stores flat. The instructors and students love them. I've had requests to make more for the students, but alas, I have a day job. So instead, I thought I'd offer some really easy-to-use plans for a non-woodworker to follow. If you are a talented woodworker and want to build a more refined product, I include notes for you. It's up to you how far you want to take it. The picture shelves can be lowered to 18 inches for children or tall items. You'll be amazed how efficient these designs are. We include a shopping list, detailed drawings, pictures, and step-by-step instructions. Click here to receive the plans. Plans are in PDF format. email address or send you junk mail. © Easelplans.biz. All rights reserved.